As the founder of Chang Thai Café and Chaiwan Enterprise, LLC, Littleton entrepreneur Emshika Alberini has multiple passions. After relocating to the US and earning a master’s degree in organizational management, she spent a few years working in the corporate world before moving to Littleton in 2008 to open her award-winning Chang Thai Café. A number of other honors followed, including the presentation by then-Gov. 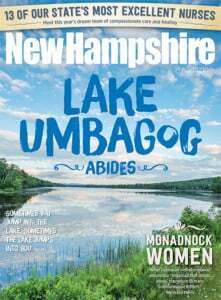 Maggie Hassan of the Most Intriguing Woman Business Leader award at the Business NH Magazine Ultimate Biz Bash 2016 and inclusion in the latest Cherry Bombe 100, which identifies influential women in food. In addition to overseeing the restaurant, Emshika also founded real estate holdings company, Chaiwan Enterprise. Not done yet, Emshika is launching her own line of food and beverages, which is coming soon. On top of it all, she thrives on working with start-up companies as both an advisor and investor. Constantly moving forward, she continues to enroll in professional development courses. She received a certificate in developing and managing a successful technology strategy from MIT’s Sloan School of Management, and is working toward a certificate in sustainable business strategy from Harvard Business Extension School.